DrumPerfect Pro got a major upgrade! You can now load up a simplified "DrumPerfect Pro Song Player" as an AUv3 instrument. From there you can select your preset and just hit play in the AUv3 host for an instant custom backing track. The update also includes a lot of other features and the base app is on sale for $14! In many ways, DrumPerfect is the best drum machine app there is. The three biggies are great freedom of rhythm composition, great freedom of tempo, and unique rules for hit randomizing. It's great to see 8 velocity levels with this app. Previously, you could velocity switch between two samples, but there were more options for switching hands and alternative strikes. This always seemed like a weird priority. It sounds like they have addressed that very nicely. I think 8 velocity levels is the exact right number. I don't understand some of the items in the new features lists. But all the real-time layer processing and editing sound promising and impressive. The workflow of the app has been a bit cumbersome compared to things like DM1/DM2. 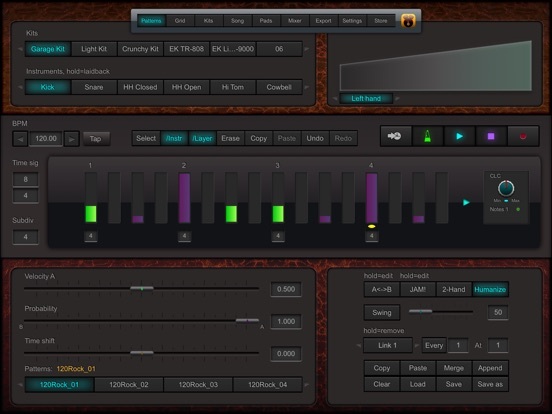 The Lum Beat apps get you a very realistic grooves-with-fills energy. That said, DrumPerfect Pro is incredibly flexible, and more powerful, just a little more tedious to create on. I'll dive into the update and see if there are any significant improvements to workflow. Well ive got to admit, i like the improvements, but i still cant get out of it what i know its capable of, spent the last couple of evenings with my coco trying to create rising flams and fills and stuff like that and its so fiddly, its annoying. That said as a sound module driven by rockdm or softdrummer its pretty decent. I do very little daw stuff, always building a song up live and recording, i trigger the drum midi using foot pedals. Which i dont think it can do. Shame though i want to master it and get the most out of the jamming stuff, am i the only one whose struggling with it? I'm sorry to hear that. I was hoping it would evolve into something that was easier to build with. The sounds are good. The options are over-the-moon good, but yea, it was always fiddly. It's a little disappointing that is still the case. Some apps just feel like you're building a ship in a bottle. This is one of them.